. Tags: pass through entity, S Corp, tax reform, taxes. General Motors Corp and Georgia’s Motors, Inc. are alike in many ways. Both go to market representing themselves to the world as corporations, legally formed entities standing on their own, capable of entering into contracts and being responsible for themselves and their activity. But while both corporations are required to report business activity for the previous year on a tax return to the IRS, only one actually pays taxes. In addition to filing a return, General Motors Corp, structured as a “C Corp,” the apex legal business entity, is the one that pays federal taxes at the business rate, currently one of the highest in the world. Georgia’s Motors, Inc. was formed as a Subchapter S corporation, aka “S Corp,” one of the pass-through entities established by law to make being incorporated easier for small firms. Any taxable income reported on its return passes through pro rata to the shareholders, to be added to their personal return and taxed at each one’s individual rate. In our story, Georgia Smith is the founder and sole shareholder of Georgia’s Motors, Inc., one of millions of American small businesses. Lately, the term “pass through entity” has been used more frequently in news reports about the tax reform proposed by the Trump administration. The increased frequency is because a significant reduction in the business tax rate is being proposed which could put GM’s corporate rate below Georgia’s personal rate, unfairly causing her to pay more per dollar of business income than GM. The good news is the Trump tax reform drafters recognized this inequity to pass-through entities like Georgia’s. As currently proposed, shareholders of Sub S Corps and other pass-throughs, like a Limited Liability Company (LLC), would still accrue the income of their businesses. But what’s new is that business income would be taxed separately, at the newly reduced, single rate paid on all business income, rather than at the personal rate of the shareholders. These proposed tax reforms are very important for small businesses because of how their taxable income manifests. Let’s say Georgia’s Motors, Inc., produces $100,000 in business income, which passes through and is applied to Georgia’s personal return. Because of how that income is accounted for, it can create a taxable event typically associated with investments, called “phantom income.” This is when the loss of an investment results in taxable income, but produces no cash to pay the associated tax. When you hear a small business owner tell you they had a very profitable year, but had to borrow money to pay their taxes, they just described what is tantamount to phantom income. But unlike true phantom income, that $100,000 hasn’t been lost. It actually exists, but in the form of inventory, accounts receivable, equity, etc., but maybe not in enough cash to pay the tax bill when due. And it could get worse: That business income added to Georgia’s personal income could push her into the next higher rate bracket. 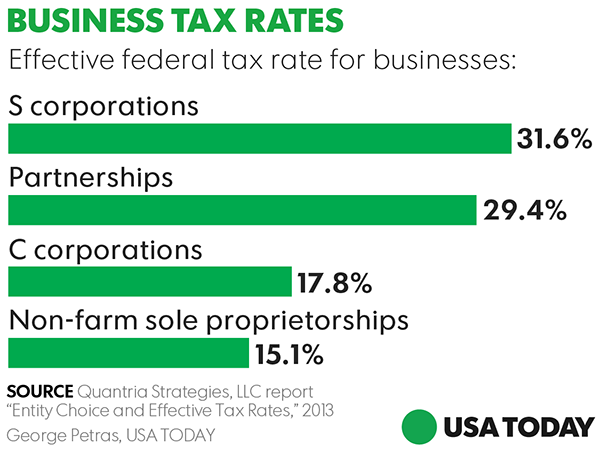 By allowing small business owners of pass-through entities to pay a lower business tax rate, in a separate calculation from their personal income, they will have more working capital to invest, and be less likely to experience phantom income. The small business sector is very excited about the prospects of tax reform, both at the personal and business level, as long as pass-through entities are treated the same as big corporations. Write this on a rock … Unleash the animal spirits of America’s small businesses with tax reform that includes lower rates applied to all business income.